What is the link between someone's visual and spatial working memory, their verbal working memory, and different types of cognitive abilities or tasks? 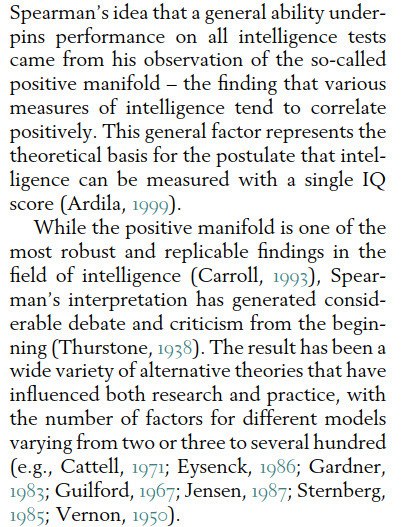 More specifically, intelligence tests (WAIS, Stanford Binet, etc.) and would this relate to educational outcomes in different fields (maybe SAT scores, graduation rates in different fields, and GPA, etc.)? Is there a relationship between these variables? Some cite working memory as the most important predictor of early academic success. Somebody who has a strong verbal working memory may generally perform well on other types of verbal tasks included on intelligence tests: vocabulary, verbal reasoning, analogies, antynoms, etc. And be better suited to learn about fields such as literature, biology, foreign languages, etc. because there is a lot of linguistic mastery required in these disciplines. Or on the other hand, if somebody has a strong visual-spatial working memory they may generally perform well on intelligence tests on other types of visual-spatial tasks that also recruit reasoning ability and long-term memory. And would be better suited to learning about fields such as physics, mathematics, art, architecture, etc. because there is more of a visual-spatial component in these disciplines. Of course, there are many other factors that affect ability and learning. Working memory would be a small determinant but a determinant nonetheless. Furthermore, there is research which shows a link between spatial ability and achievement in STEM subjects up to graduate level studies for example. 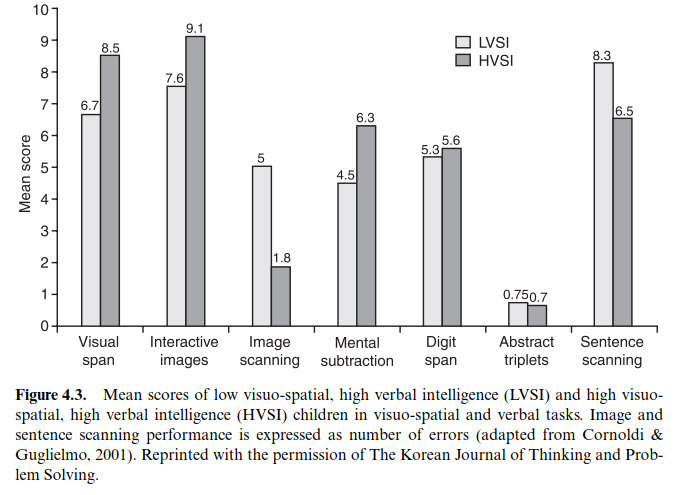 Cognitive abilities from both of these broad areas (overall visual-spatial and verbal ability) certainly overlap highly — same with other types of reasoning abilities such as numerical and logical. However, I assume each area has a bias as to what types of cognitive abilities are used more. There seems to be a very strong correlation between the two types of working memory or short-term memory. That's what I wanted to find out mainly: What is the relationship between the different types of working memory or short-term memory and other types of reasoning abilities (non-working memory reasoning tasks including verbal ability, numerical, spatial, etc.)? Are the different measures of short-term and working memory measuring approximately the same thing? How common is the occurance of individuals that have poor verbal working memory and high verbal reasoning scores on intelligence tests for example? How about for visual-spatial working memory and non-working memory visual-spatial scores on intelligence tests? I've read a few papers on this subject but am unsure of the answer. Hopefully, someone can point me in the right direction. Thanks. Timothy F. Brady, Talia Konkle, George A. Alvarez; A review of visual memory capacity: Beyond individual items and toward structured representations. Journal of Vision 2011;11(5):4. doi: 10.1167/11.5.4. What is the relationship between the different types of working memory or short-term memory and other types of reasoning abilities (non-working memory reasoning tasks including verbal ability, numerical, spatial, etc.)? Are the different measures of short-term and working memory measuring approximately the same thing? This is a good question, but you are a funny person: say hello to positive manifold. From: Sternberg, R. J., & Kaufman, S. B. (Eds.). (2011). 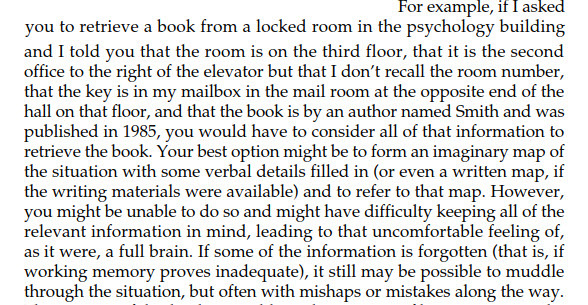 The Cambridge handbook of intelligence. Cambridge University Press. Is there a relationship between these variables? As above. The reason why WM is most predictive of academic achievement is essentially because it's thought that it's tapping into the general factor most. What you are saying sounds perfectly cogent, but you are making one important assumption here that I don't necessarily agree with: that visuo-spatial WM and verbal WM are so thoroughly dissociable that one can have one that is stronger than the other in the way that I kick a ball real good with my right foot, but am a total ponce with my left foot. Although they are considered separate cognitive structures, I would anticipate that they're still very highly correlated in most people, individual differences notwithstanding. From: Cornoldi, C., & Vecchi, T. (2004). Visuo-spatial working memory and individual differences. Psychology Press. Of course, there are many other factors that affect ability and learning. Working memory would be a small determinant but a determinant nonetheless. Here, I disagree. Have you ever attempted to entertain a complicated concept comprising multiple components, only to have it "fall out of your mind" for lack of a better word? In order to process complicated concepts, you need to have some. Working memory is king, and all other abilities are subservient to it. How common is the occurance of individuals that have poor verbal working memory and high verbal reasoning scores on intelligence tests for example? I am going to make a bold a priori claim: it is simply not possible for this to occur. To argue my point, consider what you are implying: suppose someone was reading a passage of text with a long sentence. If they had very low verbal WMC, what would happen is that the beginning of the sentence would decay before they got to the end; they could never hold the information in the fore of the mind sufficiently long enough to process it, prod it, and synthesise an idea. Likewise for a sophisticated verbal reasoning task; a complex reasoning item has multiple components that must be considered simultaneously. From: Cowan, N. (2012). Working memory capacity. Psychology press. Effectively, what I am saying is that robust WMC is a necessary but insufficient component of verbal reasoning ability. How about for visual-spatial working memory and non-working memory visual-spatial scores on intelligence tests? I'm a little confused by this, but I think you're making the same analogy as above. Same deal. However, I will make the point that WMC would represent the bottleneck in cognitive resources that would predict performance. Having made this claim simply from first principles, let me dig up some evidence for my claims.